If you have watched the films Shaun of the Dead and Hot Fuzz, then you cannot miss The World's End. As the last chapter of Blood and Ice Cream Trilogy, it has been long awaited by the cult followings. 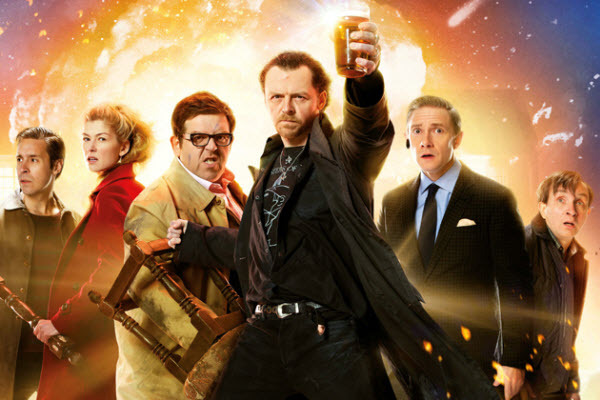 The World's End is considerably better than the ostensibly similar This Is The End, a super-indulgent American comedy which mistook f-bombs for humour and name-dropping for satire. 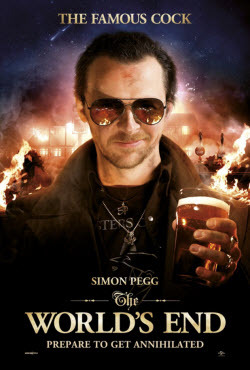 Edgar Wright's film is indulgent also, but at the service of audience enjoyment, as opposed to the enjoyment of the players. The script is surprisingly dense and intricate, many of its jokes arriving bittersweet. In an era when so many comedies are heavily (and lazily) improvised, it's refreshing to watch a tightly woven story unfold for once. The movie The World's End is rated R for pervasive language including sexual references. The movie has some scenes saluting to the Chinese Kungfu comedy Drunken Fist starring by Jackie Chan, the famous Chinese actor. The action director of the movie Brad Allen has also been in the movies Drunken Fist 3 and Gorgeous. The film wrapped on December 21th, 2012. The day happens to be the "end of world" in Mayan legend. It has already been released in United Kingdom on 19 July 2013. How to copy movie DVD - The World's End? It is annoying that DVD copy protections like CSS, RC, RCE, APS, UOPs, ARccOs, etc. always prevent you from copying DVD to DVD or hard drive. That is why Any DVD Cloner Platinum comes. There are so many DVD Cloner in the market and it is difficult for laymen to tell them apart. What really makes a DVD Cloner application excellent is that it can rip the DVD discs you want to rip to recognizable file formats for your blank discs or digital devices. Any DVD Cloner Platinum is such a comprehensive DVD Cloner and DVD ripper that it will perfectly cater to your needs. As a DVD cloner, it provides 4 flexible copying modes to copy, clone or compress DVD to DVD, DVD folder or ISO image with all protections decrypted and removed. As a DVD ripper, it can rip any DVD to MP4, M4V, AVI, M2TS, HTML5 embedded video, easy to convert encrypted DVDs to videos supported by popular devices like iPod, iPhone, iPad, Xbox 360, Android devices, etc. The interface of the program is dead-simple. Insert the movie DVD disc and run the program. It will detect the name of the DVD and analyze its structure automatically. Choose one clone mode you prefer and click start button. After the program finishes copying data to a temporary DVD folder, it would reject the original DVD disc and prompt you to insert a blank one. Just follow the tips and wait for it when writing data on the blank disc. The cloned DVD is of high quality and can be played on both of your PC and DVD Player. Let’s move to the DVD Ripper panel. Click “More” button you can find that almost all the popular devices and the corresponding support file format are in the list. Find your device and start to rip. The program offers many flexible options to change the screen size, video quality, and picture layout. Special Offer:Ultimate DVD Clone and DVD Rip Solution Suite for encrypted DVD movies with the lowest price is offered to you! 30 USD is saved if you order now!